At Wildcat, we strive to provide our customers with the best. That means when it comes to the equipment we supply, we make top-of-the-line choices that give the best, most efficient, results. For this reason, our power generator of choice is Magnum. Magnum mobile generators are specifically designed to meet extreme conditions and built to overcome any challenge. You can be assured Magnum has the power to meet your power generator needs, wherever they may be. 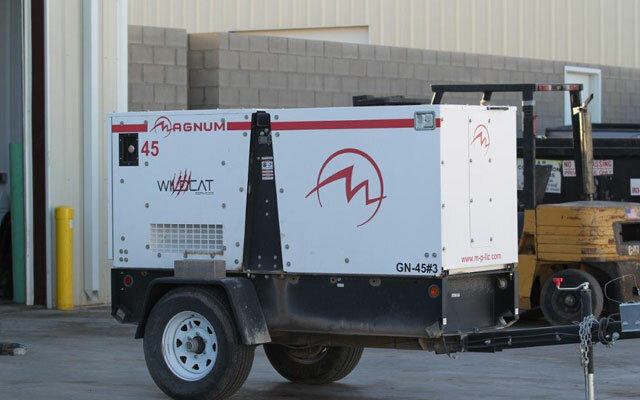 We supply Magnum mobile generators to a variety of industries, from commercial construction to electrical and mechanical projects, as well as special events. Magnum generators are some of the highest quality on the market, suited for your heavy-duty needs. We aren’t the only ones who depend on the quality behind a Magnum power generator. The United States Government relies on Magnum generators to power and light areas such as military bases and the Pentagon, as well as assist in natural disaster relief. Magnum provides the power for infrastructure construction in remote locations in Alaska, South America, and Europe. In addition, Magnum generators provide power to our troops on every continent from Uzbekistan to the Arctic. You, too, can trust the power of Magnum.